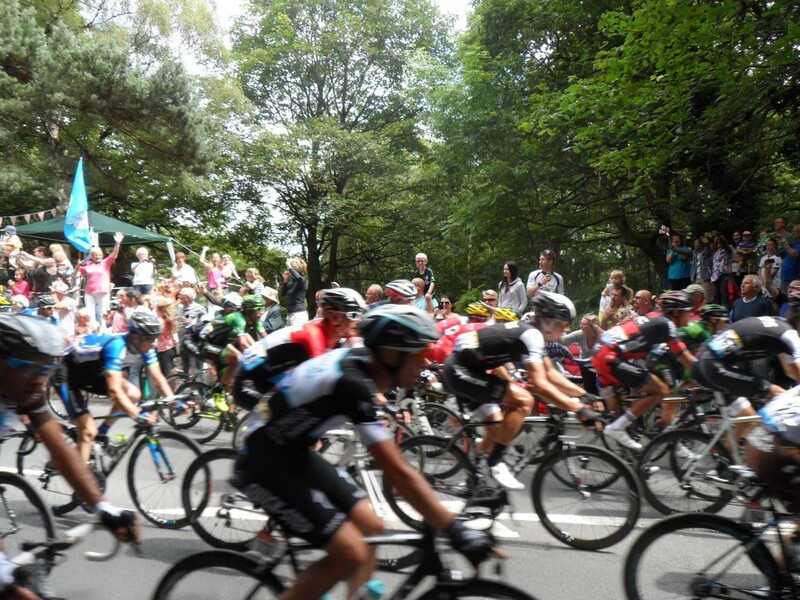 Well, it has been a while since we have posted on the blog. It doesn’t mean that we haven’t been busy, in fact, quite the opposite. I’ll try and post some more updates this week. The rain has eased up for the past week or so and the fields have started to dry out a bit. 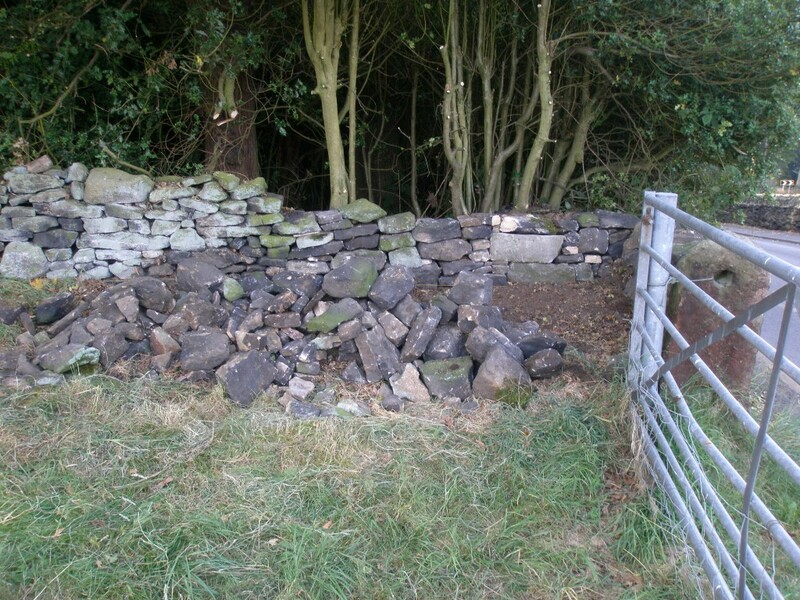 This has meant that we have been able to restart working in the bottom field repairing the last of the dry stone walls. We had to clear a reasonable amount of undergrowth before we could get to this area. When we first bought the property, you couldn’t get in here at all. We had to take a 3-4 medium sized trees to get access to this area, but it looks a lot better now that the area has been cleared. 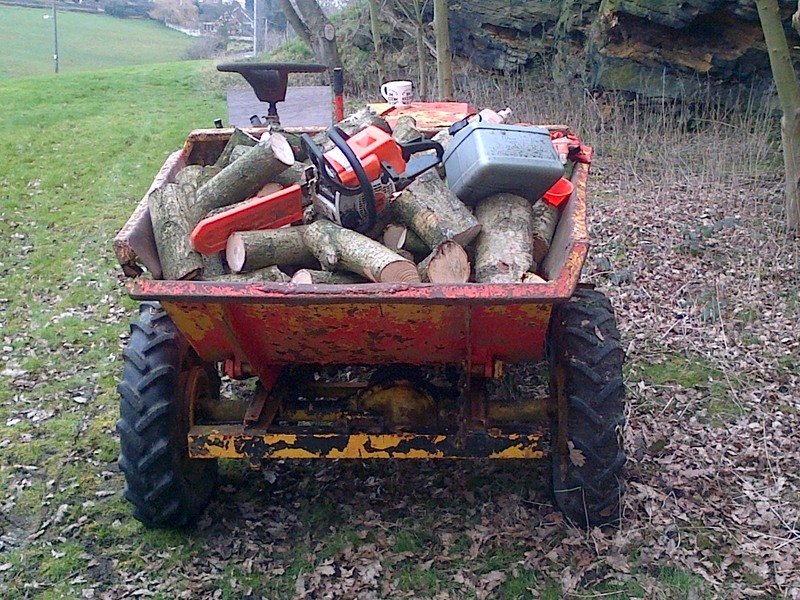 It is amazing how many logs that we seem to get from so few trees. They’ll need to dry out over the summer before we will be able to use them on the log stoves. The main issue now is where to store them. 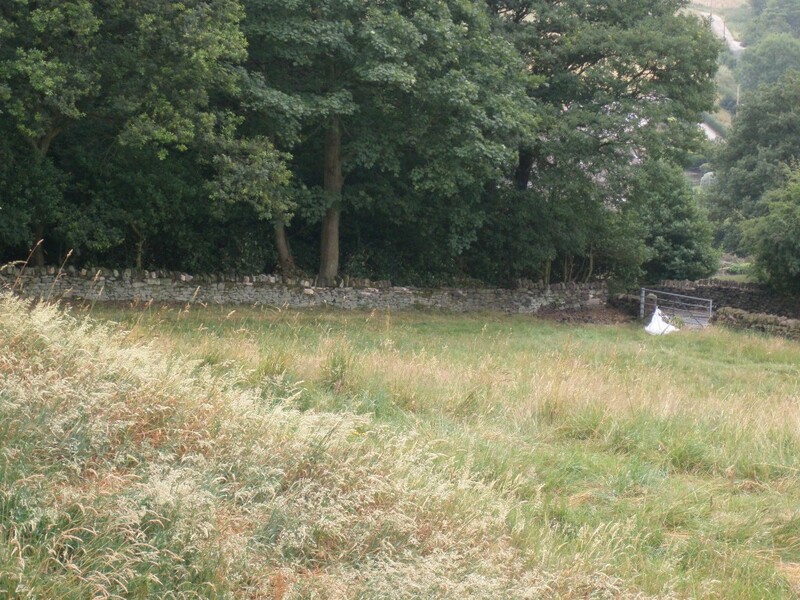 We believe that this is the boundary wall between the old quarry that was in the bottom field and Hagg Wood. According to the old maps, this quarry was no longer used from about 1899. Most of the stone for the wall was under the piles of leafs. The area to the left of the wall was a small quarry in the mid 1800’s. I suspect that much of the stone that was used to build the house came from here. 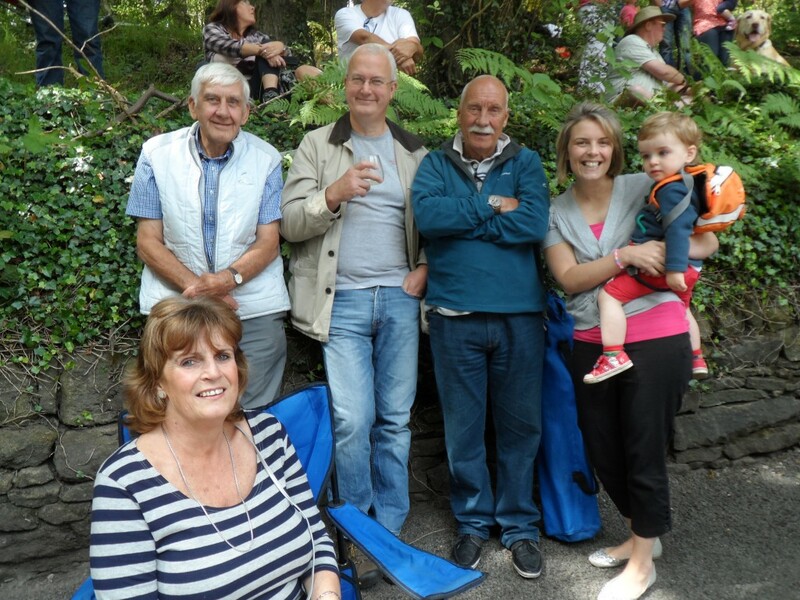 A number of the guys in the local pub remember playing in the quarry as kids. I believe that it was filled in during the 1960’s when a modern property was built next door and the quarry was used for landfill. 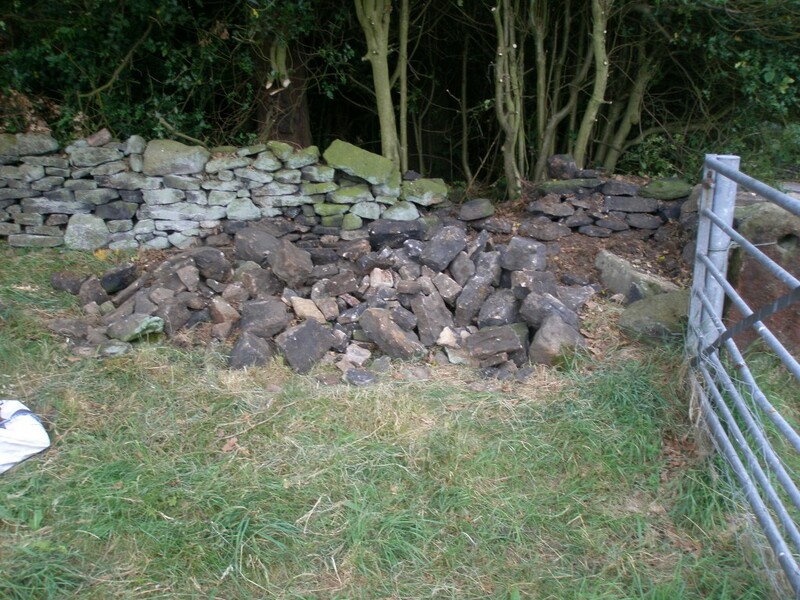 Rather than starting the wall from scratch we have taken it back down to where we could find the foundation stones. It makes repairing the wall a lot quicker! The dumper holds about 3/4 ton and this was just about on it’s limit (considering that the brakes aren’t all that good!). There is probably amount the same amount again to be collected. It’ll take about a year before these are dry enough to burn, but they should be ready for next Winter. After nearly three weeks of great weather, today it is a litte overcast. 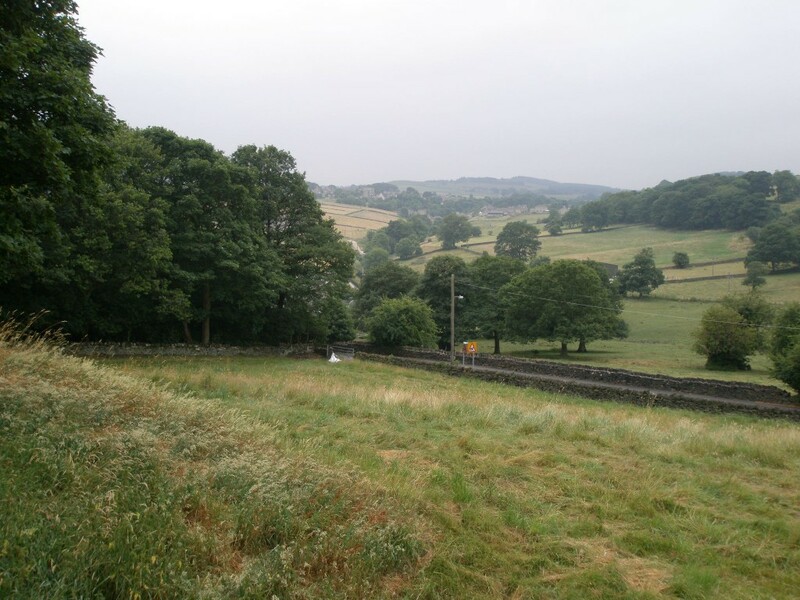 This is the view from the top field looking across the valley – even on an overcast day, it is a great view. 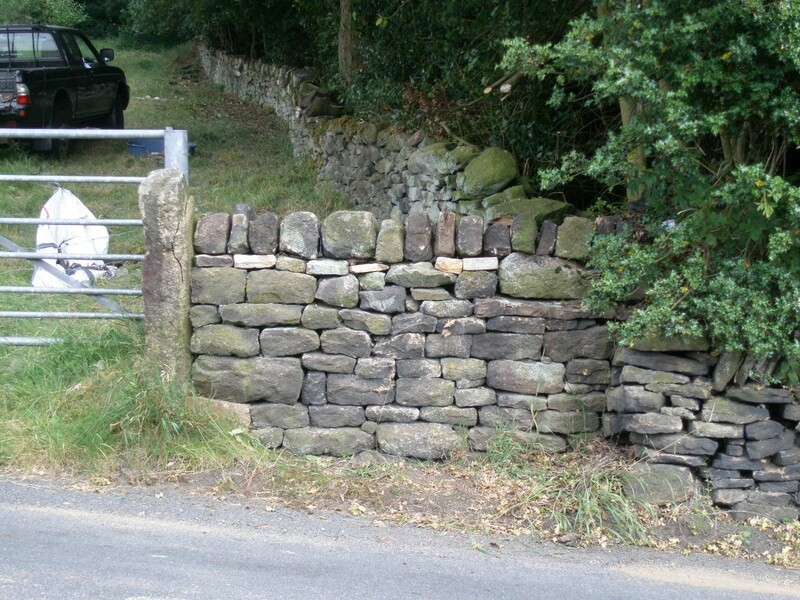 You can see the newly built wall along Hagg Wood (down to the gate with the large white bag). 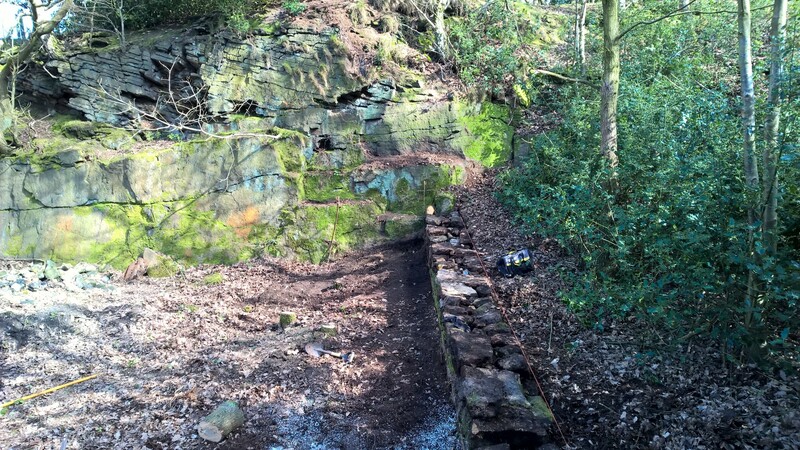 There are some missing coping stones, but the wall along Hagg Wood is now largely complete. Although much of the day today was taken up with briefing a kitchen designer (I have high hopes!! ), I did manage to spend a couple of hours on the dry stone wall along Hagg Wood today. The corner of the wall is not in the best of shapes. 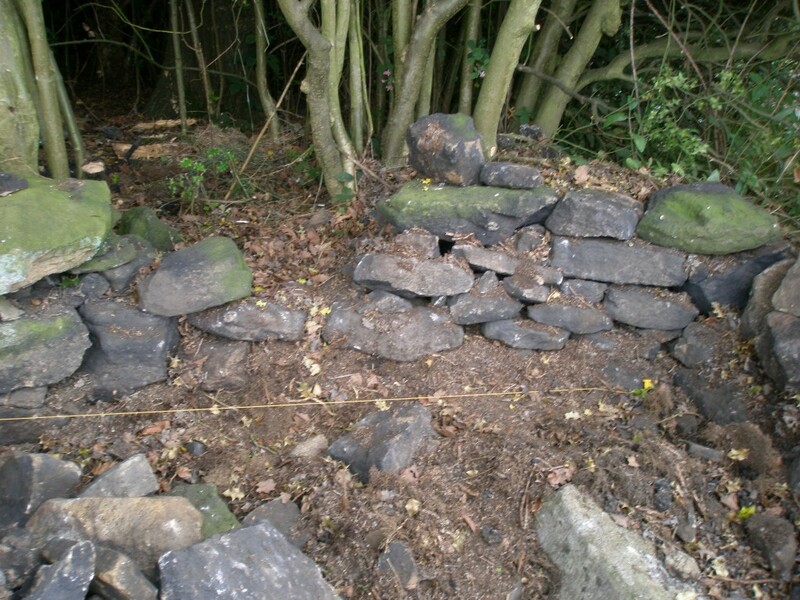 While I have managed to get away with just repairing the top 2-3 courses, this part of the wall needs to be rebuilt. While some of the wall has a bit of a “wiggle”, this part of the wall is just lost to the under growth. I have tried to keep the amount of rebuilding to a minimum and concentrate more on “repairing”. But with the corner, I have no choice. Yesterday, I spent some time digging out this part of the wall. Today will be spent rebuilding a 4m section. This is in comparison to spending a day repairing a wall when I can do 10-15m in a day. The yellow string shows where the wall should be. Mmm…there is a bit of work to do here. There is little option but to dissamble the corner of the wall and re-building. I tried to keep the amount of rebuilding to a minimum, but it had to be done. At least it is now straight. It is amazing how much stone goes into the wall when it is rebuilt. I have to admit that I did take the coping stones off and had a second go as the first attempt had a bit of a “wave” in it. This is not perfect, but better. 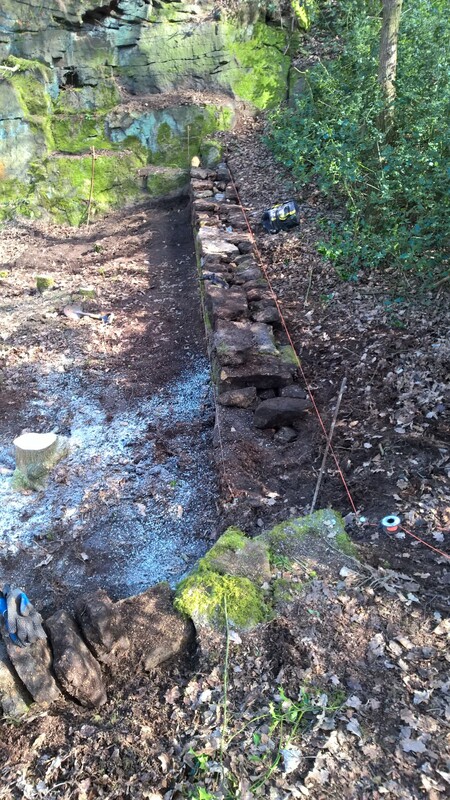 I have been working on the wall that lines Hagg Wood today. Down in the bottom corner by the gate. Unfortunately, this wall is in pretty bad shape and the small wall that backs onto the road is pretty precarious. It took me a while to trim back all of the holly just to be able to get to the road. 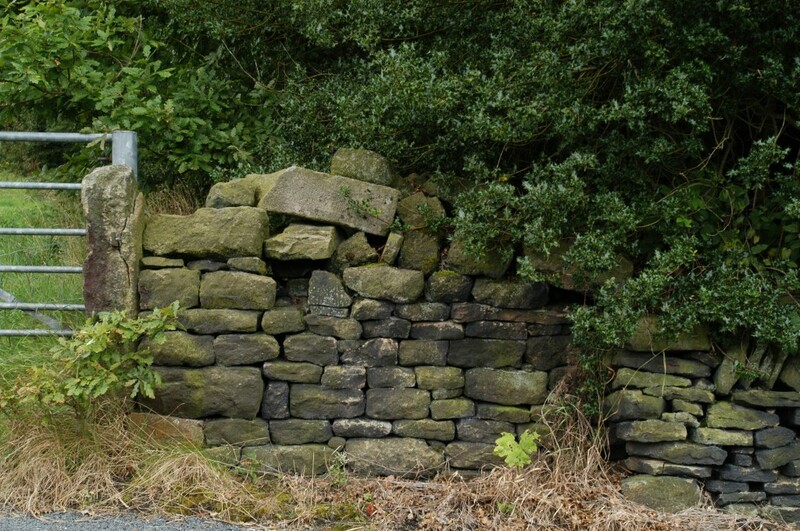 The soil is much higher here, but a bit of investigation with a pick axe revealed that it was a pile of stones – presumably fallen off the wall – rather than soil. You can see from the picture below that there was a lot of stone hidden under the grass. Clearing the holly and finding the stones took most of the day. The heat (around 30C) was pretty intense and even in the shade it was hard work. 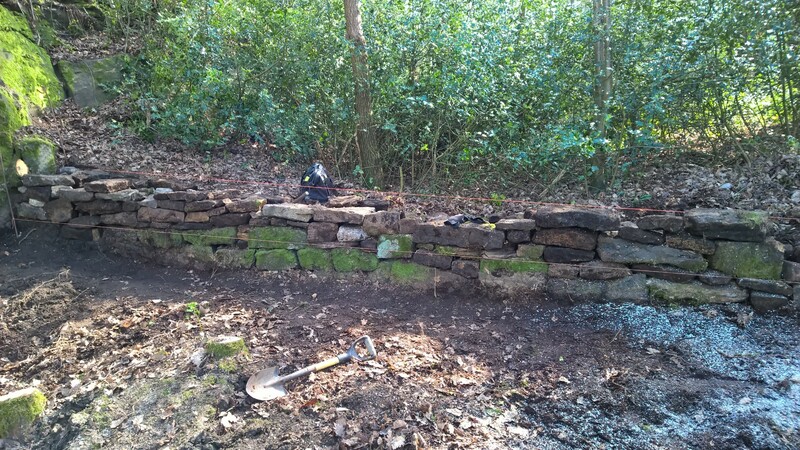 I spent an hour or so at the end of the day and rebuilt the top section on the smaller wall that runs along the road. Although it still bows a bit, it is a lot more solid than before. 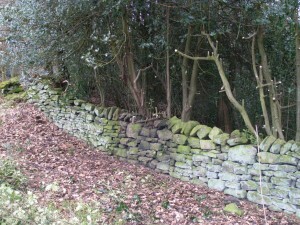 I did look back through my archive photos and managed to find a picture of the wall before I “fiddled” with it! There is a little more to dig out tomorrow and then hopefully I can finish this bottom section of wall and move up to the other end of the bottom field. The wall is in pretty bad shape here, but most of the stone seemed to be buried in the grass! 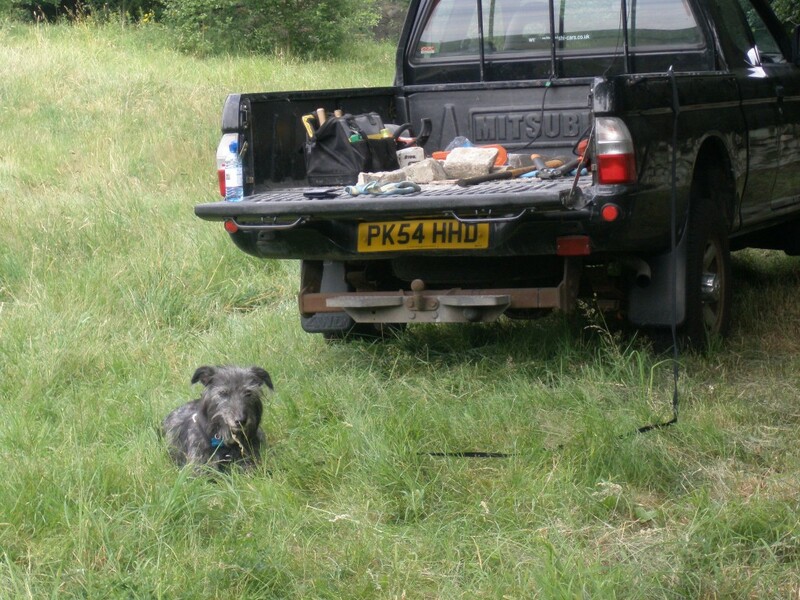 Apparently, Lurchers don’t do dry stone walling. That is for Jack Russells! This section of wall was looking pretty precarious. There is still a bit of a bow in it, but the large dodgey stones on the top have been sorted out. Note to self: Make sure you put your steel toe cap boots on before playing with a wall in this state. I managed to find this photo in my archive and it shows what the wall used to look like. 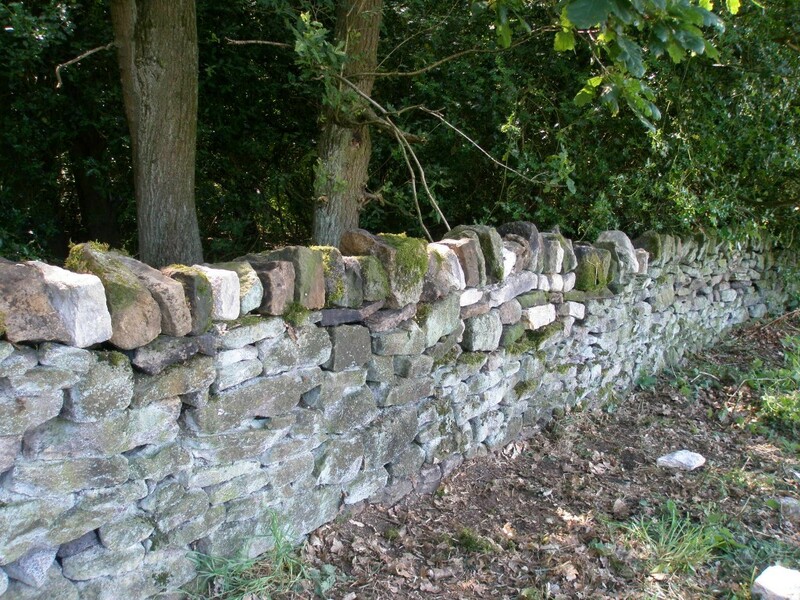 The dry stone wall in the orchard is all but finished and with the fine weather I have been looking out for a spot to work in out of the sun. The dry stone that runs along the edge of Hagg Wood is a perfect spot. It is also the other end of the property from where the builders are working. So it is pretty quiet and dust free. 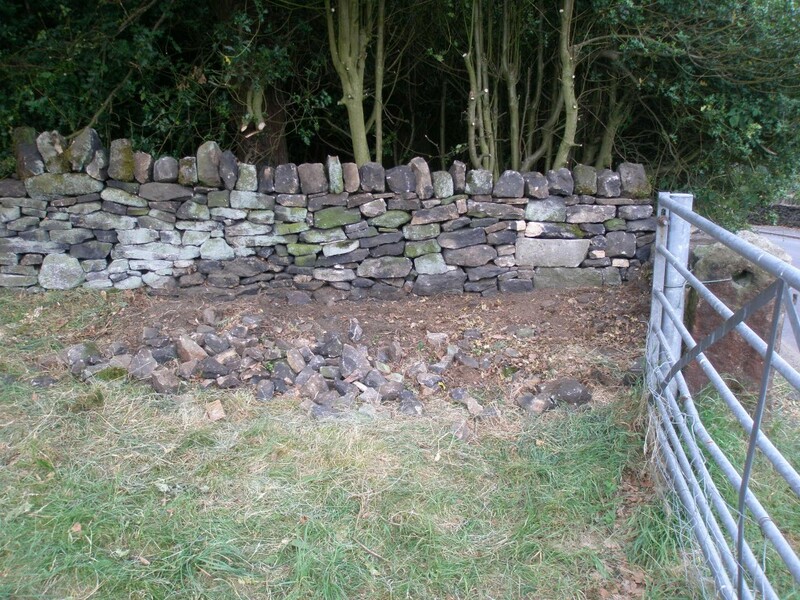 I had forgotten how much quicker it is to repair rather than rebuild a dry stone wall. It only took me a couple of hours to get this 7m section of wall back into decent shape. The trick here is not to let the wall deteriorate to a point where it has to be rebuilt. 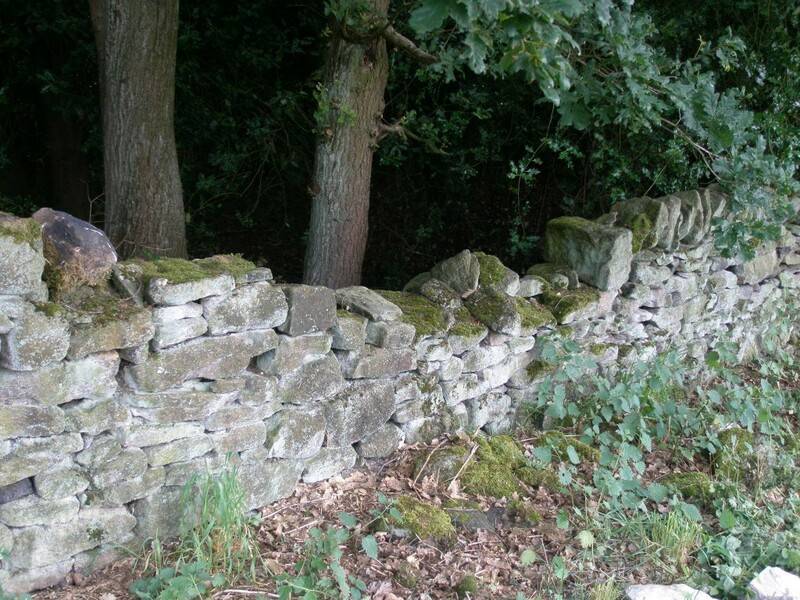 Most of the stone had simply fallen off the wall, so it was just lurking in the long grass and nettles. I did have to use a little bit of extra stone, but stone is not something that we are short of at the moment! You can see it in the photos as the slightly lighter colour due to the amount of dust clinging to the stone. It will soon blend in. Not exactly perfect, but better than it was. 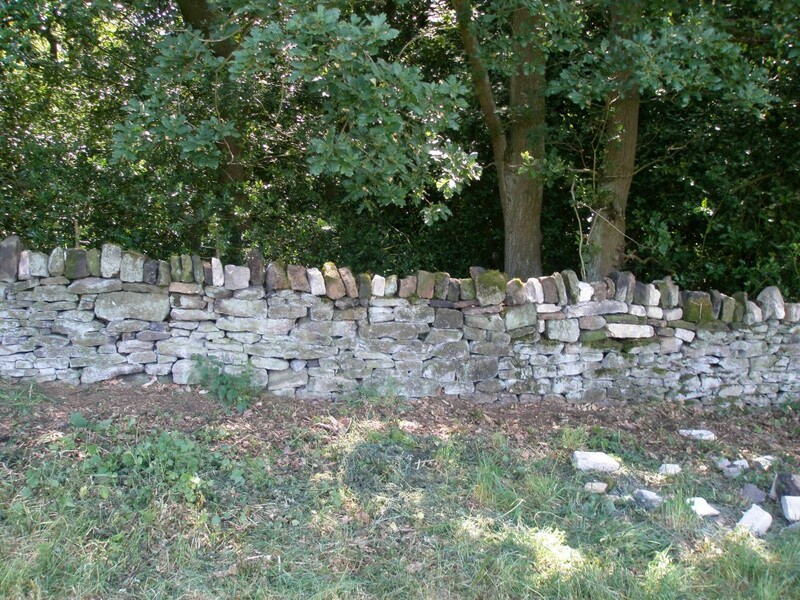 After all, dry stone walling is an abudance of imperfections. 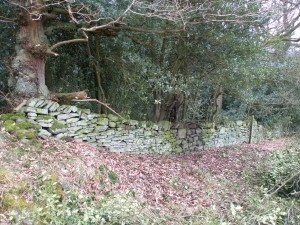 The lower field has a dry stone wall that adjoins some woodland. The woodland is largely protected by tree presevation orders (TPOs), but the undergrowth is now encroaching on our land and is starting to damage the wall. Jo decided it was time to start cutting some of this back in preparation for the wall being repaired (not quite sure when I am going to find the time for that!). We haven’t touched any of the trees, but it is largely the holly that has been removed. There are a number of dead trees, or live trees with dead branches – that also need to be cut back. It is going to be a long job, but at least we have made a start! 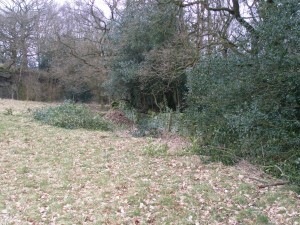 All together, there is proabably 80-100 metres of wall hidden in this undergrowth. It didn’t take Jo long to clear some of it, but already there is an impressive pile of cuttings. A very old oak tree with dead branches that has damaged the wall. This will be a case of removing the dead branches and then repairing the wall. 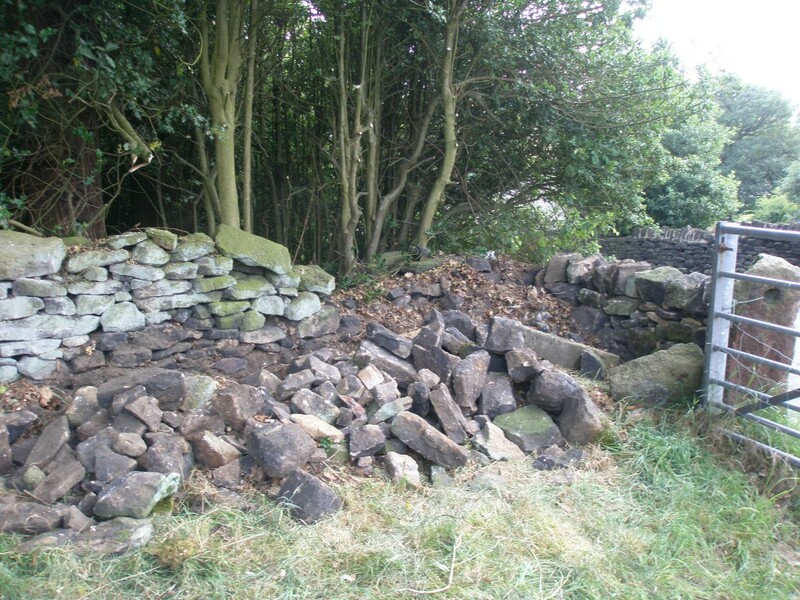 With some of the undergrowth removed, you can start to see the state of the dry stone wall. It doesn’t look brilliant, but we might be able to get away with not having to completely rebuild it. The wall in the centre of this picture has a few big stones too far up the wall – it almost looks as if it is upside down with smaller stones at the bottom and larger ones on the top!